Make sure the little Short-Tail Opossums (STOs) stay warm. A heating pad under part of their cage or a heat rock should do the trick. I prefer to give them a pouch to snuggle in as well. Young opossums may not have enough strength to use a water bottle. I make fruit available to use as a source of water so that they do not dehydrate. I find that STOs do better on soft fruits in small pieces. A quick and easy fruit option is the small Mott’s Applesauce, Mixed Berry, Strawberry, or Tropical Blend fruit cups or baby food. Young opossums can be picky eaters the same way young children can be picky eaters. You may have to try several types of fruits and various sources of protein. I use wire cages or modified plastic tubs for my adult Short-Tails. I cut the center out of a plastic tub lid and rivet hardware cloth to the underside of the lid. I also use the two part kitty litter pan and rivet the hardware cloth to the top portion of the scratch guard. I have also successfully used a variety of wire cages with solid bottom trays. A ten gallon aquarium with a tight fitting lid is also acceptable. Young Short-tails can slip through ½" x ½" wire, so keep an eye on the little escape artists. Make sure all lids are tightly secured. An easy way to catch an escaped STO is to put their favorite food in the bottom of a 5 gallon bucket. Put the bucket next to something they can climb on and they will jump in to get their food and then not be able to get out. 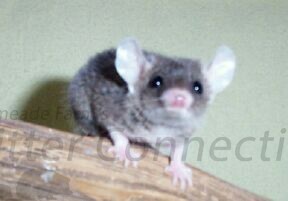 Most short tail opossums love to run in a wheel. I keep a small wooden nesting box in their cage. A Kleenex torn in strips makes a great nesting material. 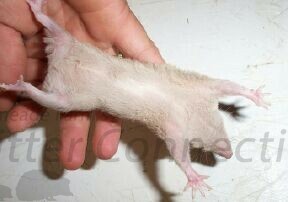 The opossums will carry bedding in their prehensile tail which is very entertaining to watch. 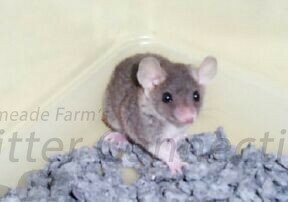 Since opossums are not rodents, it is unlikely that they will try to gnaw on the plastic or wood in their cages. I feed my opossums Spike’s Delite - Premium made by Pet-Pro Products. They only require about a tablespoon of this dry food a day, so it is very economical as well as nutritious. I feel this is an excellent, balanced diet, and I have had much success breeding my opossums using this food. You order it directly from the company at 1-877-977-8310. By using me as a referral (Gail Miller or my #G2119D) and you will save 10% on every order. Some people feed their opossums cat food as their main possum diet, but I feel they do much better on the Spike’s Delite. One drawback from using a food with a lot of filler is that the odor of the feces depends on the quality of food. The more filler in the food, the more the odor. Fresh water is a must. I use a water bottle mounted on the outside of their cage. Small amounts of fresh fruits are recommended on a daily basis. Most ST’s love apples, ripe bananas, pears, and grapes. The fruit should be cut up in small pieces so they can pick it up easily. Treats can include meal worms, super worms (only one or two per day), crickets, hard boiled egg, scrambled egg, tuna, canned cat food, and fresh fruits and vegetables. Keep your short tail opossum out of drafts. 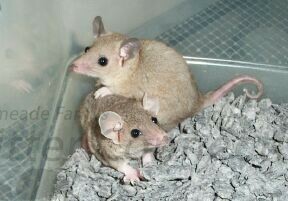 A comfortable temperature is 70° F to 80° F. I often put a heating pad under ½ the cage if I worry about the temperature. 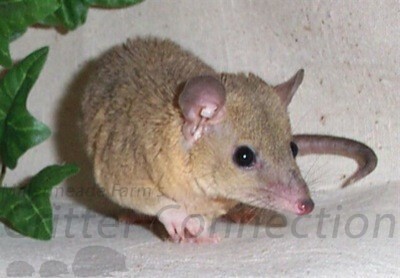 Short tail opossums are solitary animals and should be housed individually. Cage mates will eventually become aggressive toward one another and will often fight to the death. 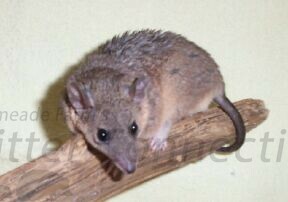 The Short-Tail Opossum (Monodelphis domestica) was imported from Brazil in 1978, by the National Zoo. Since the arrival of the original STOs, Brazil has closed their borders to exportation, thus most of the short tails in the U.S. are descendants from the original group. The short-tails are often referred to as a "House Opossum". They are more than happy to kill unwelcome insects and rodents in your house (one of mine has even killed and eaten a little garter snake!). M. Domesticus 116 pgs - $20.00 + $2.50 shipping from R-Au-2-U, Rt. 2, Box 147, Alleyton, TX 78935 (409-732-3562) VERY GOOD! 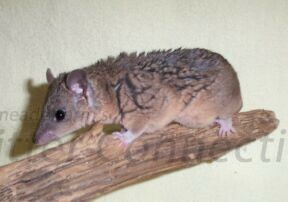 Naomi Poran is widely known for her expertise and work in raising and promoting short tail opossums.She has bred her opossums for hue and color pattern.My color guide is based on the color descriptions in her book Just Playin’ Opossum:The South American Short-Tail Opossum Monodelphis domestica. Notice the pink hues in the coloring along the side.The above opossum also has white feet but the white does not extend above the ankles. This animal has golden hues on the under belly and is overall lighter than the back color of the above picture of the Rosy. This opossum has white on its feet and it continues up above the ankle joint. This is what I consider White Boots. Although you can’t see it very well in these pictures, the animal on the right with the white ears is much lighter in color and is what I would consider gray. 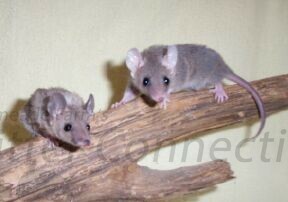 The opossum with darker ears on the left is what I would consider brown. The blotchy or spotted color description refers to a white patch on the abdomen.This is often confusing because most people would anticipate spots on the back or sides of the animal.The tail can also exhibit some degrees of being blotchy or spotted. The opossum in picture one clearly has white boots and white ears. One can barely see the beginning of the chest patch that is clearly visible in picture two.The opossum in picture three also has white boots and a visible chest patch. 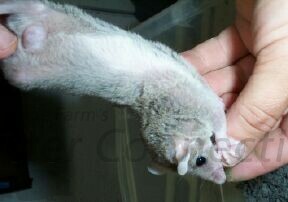 Notice the difference in the coloring of the bellies in opossums two and four. 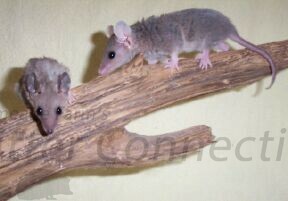 The opossum in picture number four is what I would consider ivory since it is much lighter in color than the gray one in picture number two. The opossum resting its front feet on the other opossum is what I would consider ivory.It is much lighter in overall appearance and its fur is much softer in texture. I consider the ivory color different than the golden because the color is even throughout instead of only along the sides of the animal. All of the animals in the above pictures were born and bred at Millermeade Farms.We produce an average of two litters per month and the color shades and hues vary in each litter. For this reason it is difficult for us to predict what colors and hues we will have available at any given time.